Poolside slave quarters. And "beautiful" to boot. I took this photo in 1988 on my one and only visit to New Orleans, where my sister was living at the time. First visit, I should say, since our family moved away from New Orleans when I was very small. What an intriguing city ― and what a heart-rending tragedy that befell her in 2005. Among other things, I took in some Civil War sites: Confederate Memorial Hall (just reopened) which claims to have "the second largest collection of Confederate memorabilia in the world in the oldest continually operating museum in Louisiana"; Metairie Cemetery; a house once belonging to Pierre Gustave Toutant Beauregard. . .
New Orleans is so infused with its own unique history ― its own original culture ― one can't help but be fascinated, or seduced. The religion, food, music, language, none of it reminds you of Dubuque. Same river, different feedcaps. The city has seen some changes since slaves lived in this now-desirable, 1-bedroom unit in the French Quarter. Fewer slaves, more pools, for one thing. Thank goodness the Quarter was spared. New Orleans is a city apart, a melting pot unto itself. The soul of the city will be revived, in time. "The dead are heroes, the living are but men compelled to do the drudgery and suffer the privations incident to the thing called 'glorious war.'" Turns out our tour guide on Saturday has fit in a stop for our group at the Tennessee State Museum to see the Old Glory exhibit (I'm still on my own for Old Hickory's crib). Getting ready to leave town, even for a few days, is a stressful time for disorganized people. First, there's making sure your work is covered in the office, anticipating and averting crises, and catching up on all the stuff you failed to get done in weeks past. And for crying out loud, don't forget to roll out the recycle bins. Good feeling, though, to finally shut down the system and head out, knowing there are four days of battlefield tramping ahead. Zeus knows the carpal tunnels can use the time off. Saturday, author Mark Zimmerman will guide us all day around Battle of Nashville sites. Finally, Sunday morning, Carter House historian David Fraley will give a presentation at Sam Watkins's grave near Mt. Pleasant. Monday morning I'll be back at my desk, just over the Santa Cruz Mountains from Half Moon Bay, scanning 100s of unread emails and explaining to my coworkers why some people use vacation days to travel to Tennessee in winter (technically spring), to stand in the cold and photograph muddy fields. We've got room in Brentwood if you want to join us, but you'd better act fast. Leave a message at the Brentwood Suites, and I'll call you back. Old Glory is back in town. What is purported to be the original "Old Glory" flag from the 1820s — the first U.S. flag to fly over a recaptured secessionist state capitol building — has returned to Nashville after a century. It's about time. Intrepid battlefield trampers from The Civil War Forum will be descending upon Tennessee two weeks from now to cover Stones River, Spring Hill, Franklin, and Nashville (and there are still a few seats available on the tour bus). We don't have the Tennessee State Museum on the itinerary, but I hope to find time to take it in between the close of the conference on Sunday and my flight back to the Left Coast, but I need to be realistic. I have a bad habit — whenever I have occasion to fly into a city I don't know or rarely visit — of trying to fit in one-too-many stops at some local historic site. 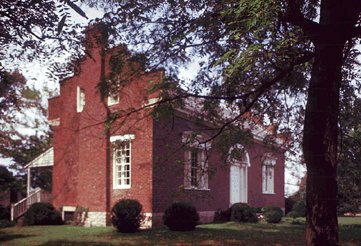 Two times I have had occasion to fly into and out of Nashville, and both times I overreached and tried to take in Andrew Jackson's Hermitage before returning the rental car. Both times I made it as far as the Hermitage parking lot, where I studied my watch and made precise risk/reward calculations before deciding I was cutting it too close, and shot off in a high-speed trail of tears to the airport. Either the third time will be a charm, or I'm writing off Old Hickory for good. The nickname for the United States flag, Old Glory, was originally attached to a flag made in 1824 for a young sea captain, William Driver (1803-1886) from Salem, Massachusetts . When first gazing at the flag, Driver was supposedly moved to call it "Old Glory," a name he used to describe the flag throughout his lifetime. Old Glory gained its notoriety during the Civil War when Driver, who had moved to Nashville in 1837 after his wife died, raised the flag at the State Capitol after Nashville was captured by the Union Army. "We are extraordinarily proud to have Old Glory return to Nashville where its fame originated before spreading across America ," said Lois Riggins-Ezzell, executive director of the Tennessee State Museum . "This is a singular opportunity to see a treasured artifact of Tennessee and U.S. history, and we hope the people of Tennessee and surrounding states will take advantage of this rare chance." 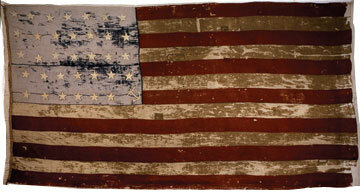 Old Glory was originally flown from Driver's merchant ship in the 1820s/1830s. When in Nashville , he hoisted it across the street at each national holiday and on his birthday of March 17. As the Civil War drew near and sentiment for the Confederacy grew in Nashville. Driver, a staunch Unionist, reportedly hid Old Glory by having it sewn into a quilt. 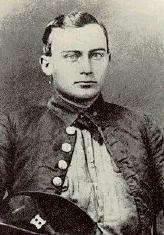 The war divided Driver's family as his two sons fought for the Confederacy and one son was killed at the Battle of Perryville. In 1862 Nashville became the first state capital in the Confederacy to fall to Union troops. Upon the arrival of Union soldiers, Driver removed Old Glory from its hiding place and flew it from the State Capitol. The newspapers of the time ran stories of Old Glory being brought out of hiding. Before long, people began referring to all U.S. flags as Old Glory. Originally a 24-star flag when it was created for Driver, Old Glory was re-sewn around 1860, adding 10 more stars for the states that had joined the Union after the flag was originally constructed. An anchor was also added on the canton of the flag, which referred to Driver's experiences as a sea captain. Old Glory remained in the Driver family until 1922 when it was presented by his daughter, Mary Jane Roland, to President Warren G. Harding. The flag was in a very delicate condition, and it essentially remained in storage until 1981 when Tennesseans raised the funds necessary to begin conservation efforts. Saw mention of this article over at Kevin Levin's Civil War Memory site — perfect fodder for examining the "memory" of that defining era in American history. Claude Turberville, quoted in The Mississippi Press, is a reenactor, which is to say he engages in "combat karaoke" (a phrase I first saw used by, I think, Prof. Wolfgang Hochbruck). These days I'm more or less desensitized to assertions, like that attributed to Turberville, that "many people believe the Civil War was fought over slavery. It was not. It was initially about states' rights and taxes." This kind of thing is not going away, no matter what. It's an article of faith in some quarters, like the idea that you'll catch a cold if you go outside with wet hair in winter. It's easy to see the connections. People who go outside with wet hair do frequently catch a cold — albeit from rhinoviruses unrelated to hair. And the Civil War was about state rights — specifically the "right" to perpetuate slavery and to expand it into the vast territories of the growing nation before free soilers got the upper hand to an extent that could never be overcome. One can make a coherent proposition that places the concept of state rights at the core of the sectional rift. It has to be phrased carefully, and not overreach, lest it expose the unavoidable underpinning that is slavery — not everyone has the stomach for The Apostles of Disunion, or Alexander Stephens's "Cornerstone Speech." But one can at least build an argument about state rights without making things up out of whole cloth. An argument can be offered that allows one to retain a modicum of dignity, and to avoid sounding like a Borg drone parroting a neo-Confederate bible. But this business about "black Confederates" drives me nuts. As Turberville tells it, "Black soldiers fought alongside white soldiers in the Confederate Army." Sigh. 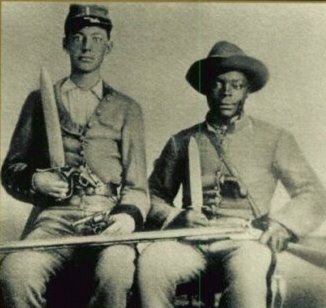 Now, most everyone with a passing interest in the subject of black men under arms for the Confederacy — everyone who's ever argued the point — is well-acquainted with the documentary evidence and anecdotes alike: the pensions, the body servants who picked up a gun, the slaves who rode with Forrest, the teamsters in Lee's retreat from Gettysburg. We've read Richard Rollins's expositions on familial bonds between black and white Southerners, and Art Bergeron's solid accounts of some individuals from Louisiana. We know about the short-lived Native Guard in New Orleans, the phantom black regiment on the Peninsula, the illusive black cannoneers at First Manassas. Likewise, we know about the abortive attempts to field black CS regiments in the waning days of the war. We've seen Walter Williams's column, and the numbers attributed to Dr. Smith of American University. And yes, we realize Williams and Smith are African Americans — that qualification is always included, as if it somehow obviated the need for actual substantiation. When we lay all the evidence out neatly, and scrutinize it closely, there is one incontrovertible fact that cannot be denied: except in the rarest of instances, black soldiers did not fight alongside white soldiers in the Confederate Army. As a matter of fact, blacks were not allowed in the ranks of Southern armies. That's why, when it did occur, the occurrence was isolated and exceptional. What blacks did do was flee to the protection of Union arms by the 100s of thousands (is that part of Turberville's classroom presentation?). Some 180,000 of them donned Union uniforms and fought against Confederate armies. The idea that blacks in any significant numbers fought in CS armies is a myth designed to disassociate slavery from secession and war. It is an enduring tenet for latter-day proponents of the Lost Cause apologia launched long ago by folks like Edward Pollard, and Jubal Early. Notice how, in Turberville's telling (or at least in the way he was quoted), it's an important distinction that blacks were segregated in Union armies, but fought side-by-side with whites in Confederate forces. Lost Cause apologists and neo-Confederate fictioneers invariably seek to seal the deal by highlighting racism in the North, as if the near-universal conviction of white supremacy among white Americans of that time had some bearing on the question. Slaves and free blacks fighting for the Confederacy is an extension of the ultimate irony, in keeping with secessionist Fire-eater rationalizations that theirs was a fight for "liberty" (the liberty to enslave others). And yes, I think I did just make up the word "fictioneer." I kind of like it. I hope it's original. Let us all humble ourselves. We don't have to make stuff up to honor our ancestors' memories, or to enjoy studying the past (though of course, we do — I don't know why Lost Cause mythology troubles me more than tried and true myths from the American Revolution, or other staples). Still, we don't need to pretend that Lincoln thought blacks were the equal of whites. He didn't. We don't have to pretend the war was one glorious effort at emancipation from start to finish. It wasn't. And likewise, there's no sense in pretending that the future of slavery wasn't the very crux of the sectional conflict — the issue that required difficult compromises between free soil and slave soil to forestall hostilities for decades, the issue, more than any other, that ultimately precipitated secession, and war. Because it was. That's what the historical record tells us. It's what the architects of secession themselves tell us. If it were only Mr. Turberville and his weekend warriors validating each other's beliefs around a friendly campfire, where's the harm? Or testing their positions against the beliefs of other adults in various forums — who could complain? But going into elementary schools and dressing up fraudulent declarations as the considered conclusions of honest research, that's something else. I'm guessing that when the gentleman in question talks to school groups, and tells them about the mythological integrated armies of the South, he stops short of telling them that as late as 1864 — 1864! — General Patrick Cleburne was nearly run out of the Confederacy on a rail for daring to suggest the South begin enlisting slaves into the army in return for emancipation. I'm confident that Mr. Turberville neglects to tell the children that when the Confederacy had its back to the wall before the spring campaigns of '64, the CS leadership would not consider for a moment giving up slavery to gain the one ingredient it most needed to ensure independence: manpower. Without slavery, what was the point of independence? You can be assured that, standing before impressionable school children — where his uniform imbues him, in the eyes of the kids, with the authority of someone who knows what he's talking about — Turberville stops short of quoting Confederate Congressman Robert Toombs, who denounced efforts to create slave regiments even with the CSA in its death throes, worrying that if blacks could be soldiers "our whole theory of slavery is wrong." Again, if it were just Turberville, his buddies and their families, regaling each other with tales of black Confederates, I'd say, "knock yourselves out." But unfortunately, thanks to his casually inane myth-making in classrooms of young children, there will always be new standard bearers to step up and take his place whenever the Lost Cause flame starts to flicker.